I finally got this painting finished. Well, as finished as I intend to make it! While there is definitely room for improvement, I am satisfied with the painting. In spite of the challenges, I did enjoy painting it but I am also ready to move on. I took this picture minutes after I had finished so when it is a bit dryer, I will take another one with some better lighting. I am going to change things up again. As I mentioned in a previous post, I will be giving daily painting another try. I have learned a few more things and will see how it goes. I am also working on a larger piece for a special event. I will have more about that as it develops. I will not be online tomorrow so any comments on this post (always appreciated!) will be delayed by a day. Tomorrow is my father's birthday. He would have been 72. He has been gone for four years now and I miss him dreadfully. I am going to take the day off for rest and remembrance, beach walks, working on music, and other uplifting activities. I will be back in the studio on Friday rested up and ready to get started on the next project or two...or three! And I hope it was a soothing day for you Renee! The painting looks wonderful and I can hardly wait to hear more about your large work and how the daily paintings are going!!!! And THANK YOU for the kind words about my blog in comments of your last post. Wow Renee.. the picture turned out really well! 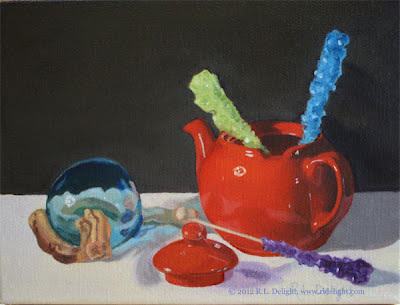 I especially like the highlights in the teapot - lovely! Thanks Theresa and Dana! I am woefully behind on blog reading lately. I will have to brew a good cup of tea and sit down to read, and comment, soon. @Dana, I have lost contact with your blog for some reason. Are you still posting on it?